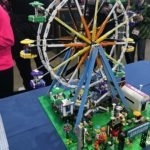 Do you like to build and create structures with Legos? If so, join us for Nick’s Bricks, the Annual Lego Event at the Pybus Public Market on Saturday, March 2nd from 10:00am to 3:00pm. LEGOS WILL BE PROVIDED. There is no cost to participate (donations will be accepted). Nick’s Bricks will include these activities: LEGO Make & Take LEGO Jewelry Making LEGO Spaceship Making LEGO Displays LEGO Robotics Demonstrations Door Prizes Music Snacks Don’t forget to wear your flannel shirt! Last year (2018) this event drew over 600 participants and 75 volunteers.